Hosting a successful conference starts with choosing the right venue. But in order to decide where to hold your event, you’ll need to consider several factors. Will there be enough hotels available to accommodate your guests? Will the venue be close to local restaurants and bars? To answer these questions, SmartAsset ranked the best cities in America to host conferences. 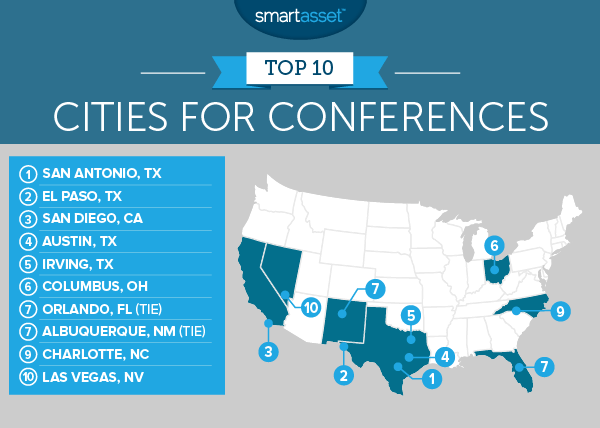 This is SmartAsset’s second annual study of the best cities for conferences. Read the 2015 study here. To find the best cities for conferences in 2016, SmartAsset ranked 102 of the largest U.S. cities using the same nine factors that we included in last year’s analysis. We considered the availability of hotels, hotel room rates, the average cost of a restaurant meal and the proximity of each city to a major airport. We also looked at the violent crime rate in each city and the concentration of bars, restaurants and other entertainment establishments. You can read more about our methodology below. Moving to a new city? Find out if you’re better off renting or buying. Stop by San Antonio. With its rich history and thriving nightlife, it’s no surprise that San Antonio ranks as the best city for conferences for the second year in a row. Three of our other top-ranking cities are also located in Texas. NYC didn’t make the cut. While it has more hotels than any other city in our study, the Big Apple didn’t rank in the top 10 this year. Neither did Los Angeles. These cities tied for the 18th spot on our list. Since last year, the average hotel room rate in New York City has increased by 3.7%. The average cost of a restaurant meal has also risen slightly. San Antonio has more hotels than most of the cities in our study. It also has a number of large venues like the Alamodome, a facility that seats more than 65,000 people. But those aren’t the only reasons why so many groups and organizations choose to hold their conferences in the Alamo City. The city’s warm weather might make a trip to San Antonio seem more appealing. It’s also an inexpensive place to visit. According to numbeo.com, a three-course at a mid-range restaurant costs just $22.50, on average. El Paso is another affordable place for conference-goers. A single night at a hotel costs just $92, on average, according to Hotels.com. So a business trip to the city shouldn’t break the bank. When you’re not waiting around for a meeting or workshop to begin, you can visit a museum, stop by a casino or tour a winery. Before you leave, you might want to check out Scenic Drive for a spectacular view of the city, its mountains and part of Mexico. 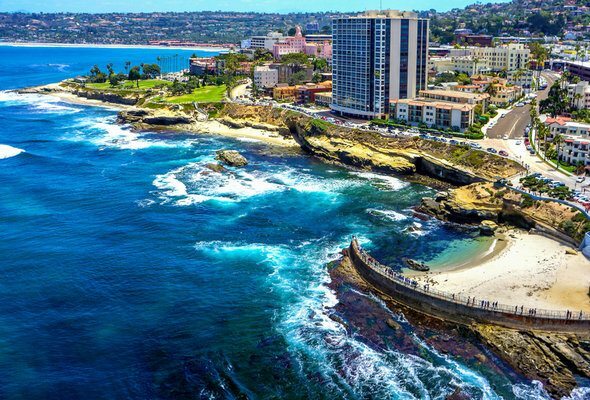 San Diego is a popular city for conferences. But even if there are a lot of events taking place when you’re in town, you shouldn’t have much trouble finding a place to stay. There are 255 hotels in San Diego and the average cost of a single night at a hotel is $147. That’s significantly cheaper than the average hotel room rate in New York City ($254) and slightly cheaper than the average cost of a hotel room in Los Angeles ($175). Visitors come to Austin throughout the year for all sorts of conferences, festivals and events. Some of the city’s most popular venues include the Austin Convention Center and the Palmer Events Center, which has a 70,000-square foot exhibit hall and five different meeting rooms. 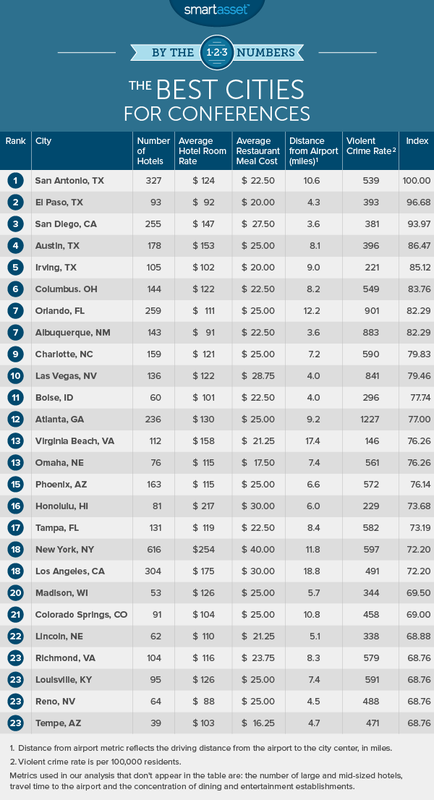 Compared to other major cities, Austin’s cost of living isn’t nearly as high. Plus, the state of Texas doesn’t collect any income taxes. But spending a night at a hotel in the city could cost a bit more than you expect. The average hotel room rate in Austin is $153. That’s the highest hotel rate among the top 10 cities in our analysis. Irving is home to about 236,617 residents and has a low violent crime rate. As one of the safest cities on our list, conference attendees should feel comfortable traveling to the area. What’s more, it’s not an expensive place to visit. The average three-course meal at a mid-range restaurant costs $20 per person. Columbus is the only Midwestern city that cracks the top 10. If you’re supposed to attend a conference in the city, don’t worry about running out of things to do in your spare time. In fact, according to the Census Bureau, Columbus has a higher concentration of dining and entertainment establishments than San Diego or Orlando. In the evenings, you can see a show at the Ohio Theater. And just south of downtown Columbus is German Village, a historic district with tons of bars, restaurants and shops. Quite a few conferences are held in Orlando and some – like the Institutional Investors Conference – take place in the city every year. What makes Orlando the perfect place for these events? For one thing, it has the second highest number of hotels with more than 250 employees. Conferences that don’t take place in hotels may be held at the University of Central Florida or the Orange County Convention Center, a 7-million square foot venue with over 2 million square feet of exhibition space. Hosting a conference in this desert city could be a good idea, especially if you want your attendees to have access to cheap hotel rates. A hotel room costs just $91 per night (on average). That’s the lowest hotel room rate among the top 10 cities and the third-lowest rate in our entire study. Albuquerque is the Ballooning Capital of the World. So if you have free time, taking a hot air balloon ride is a must. What’s also worth noting is that the closest major airport – Albuquerque International Sunport – is roughly nine minutes away from the downtown area by car. That means getting from the airport to your hotel room (or Airbnb) should be a breeze. Besides Orlando, Charlotte is the only other city on the East Coast to rank as one of the best cities for conferences. The up-and-coming city has a number of attractions, including the NASCAR Hall of Fame located in uptown Charlotte. There are 77 mid-sized hotels in the city, meaning that it has the fourth-highest number of hotels in the top 10 with 20-250 employees. Las Vegas has the highest concentration of dining and entertainment establishments among the top 10 cities in our study. But that makes sense, particularly when you factor in all the bars, restaurants and casinos on the Strip. Whether you’re visiting the city for business or pleasure, you’ll find that Vegas is a relatively affordable destination for single travelers, as well as families. A hotel room costs $122 per night, on average. Number of hotels (three metrics). Since hotel availability is important for anyone attending a conference, we looked at three different factors related to hotel accommodations: the total number of hotels in each city, the number of mid-sized hotels (with 20-250 employees) and the number of large hotels (with more than 250 employees). Note that we included any city with at least one large hotel in our study. Hotel room rate. This is the average price paid per night for a hotel room in 2015. It includes taxes and fees. Restaurant meal cost. This is the average cost of a three-course meal for one person at a mid-range restaurant (as of October 2016). Airport distance (two metrics). This is the distance between each city’s downtown area and the closest major airport, in miles. We also looked at how long it would take to drive from each city to the closest airport. Violent crime rate. This is the number of violent crimes per 100,000 people in 2014. Concentration of dining and entertainment establishments. This is the number of restaurants, bars and other entertainment establishments as a percentage of all businesses in each city. We ranked all 102 cities in our analysis across each of our metrics. Then we averaged our rankings and gave equal weight to most of our factors. We gave half weight to our two factors related to airport distance. Finally, we created an overall ranking based on our averages and assigned each city a score between 0 and 100. The city with the highest average ranking scored a 100 and the city with the lowest average ranking scored a 0. Data on hotel room rates comes from the Hotels.com® Hotel Price Index™ (HPI™). Data on hotel availability and the concentration of dining and entertainment establishments come from the U.S. Census Bureau’s 2014 Zip Code Business Patterns database. Data on restaurant meal costs comes from numbeo.com. Violent crime data comes from the FBI’s Uniform Crime Reporting database and local government websites. Data on airport distance comes from Google Maps and citylab.com.